After hours of research and testing out many of the highly rated steam mops on Amazon, we’ve picked our favorite. It’s actually the one I use now at home for all my hard flooring! 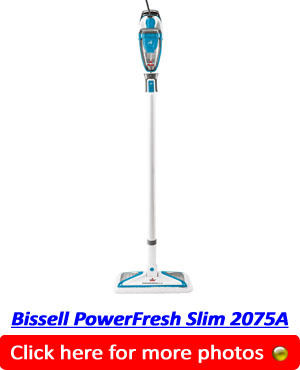 The best steam mop 2018 for hardwood flooring, laminate and tiles is the Bissell PowerFresh Slim 2075A. It’s actually a full steam cleaning system and does more than just your hard floors. Read all about it in my review below. A good steam mop can cut your chores time in half. I should know! I used to use a standard mop and bucket to clean my hard floors after I’d vacuumed them. (At first, I was even slower because I brushed the floors by hand instead of vacuuming). Since I started vacuuming my kitchen, living room and bathroom floors first and then using my Bissell PowerFresh 3-in-1 Slim steam mop to clean and sanitize them, I’ve gotten the cleaning time down from 50 mins to just over 20 mins. Bissell’s PowerFresh Slim is an all-around, go-to 3-in-1 steam mop. It easily cleans sealed hardwood floors, ceramic tile floors, marble, granite, and linoleum. It also goes from being an upright mop to a handheld steamer that cleans giving your excellent cleaning over multiple surfaces. This is one of the handiest steam mops available and it comes with all the tools you need to clean virtually any surface, including drapes, in your home. Use it to mop your floors and sanitize them with pure steam and the microfiber cloth that picks up dirt without marring surfaces. It can eliminate up to 99 percent of bacteria and germs as long as you use the microfiber pads. The tools are on board and include an angle tool, a bristle brush, a cloth tool, a grout tool and a flat surface tool. You can attach them to the extension wand and use the PowerFresh 2075A base unit to clean blinds or drapes. You can also attach the bristle brush (which is like a toothbrush head) to the handheld unit and scrub your countertops or stove. Because the tool swivels, you can easily get into tight corners or around vanities and sinks in the bathroom. Customers who have bought the PowerFresh Slim 2075A love it because it really does clean up even old, stuck-on dirt or grease in the kitchen. It is handy to reach for anytime when you install the wall mount bracket included with it. You can also choose what you fill the tank with. Use distilled water if you are inclined or simply use tap water. Customers love that it is lightweight and yet the steam lasts long enough to get a whole entire room cleaned. While it does a great job of cleaning just about any surface, it will not work for cleaning stains or spills on carpets. For carpet stains, try these tips. Still, for what it can do it is well worth the price and it comes with the quality Bissell is known for. This steam mop has been designed for robust cleaning and an enhanced user experience at a great value price. Ergonomic design. The LIGHT ‘N’ EASY Steam Mop has an advanced ergonomic design that yields a stellar user experience. Additionally, it has a soft grip for better handling and easier maneuverability. Lightweight construction. It has a lightweight build and weighs fewer than 4 pounds. The light-weight design and build negate the amount of energy that users expend in their cleaning endeavors. Effective mopping system. 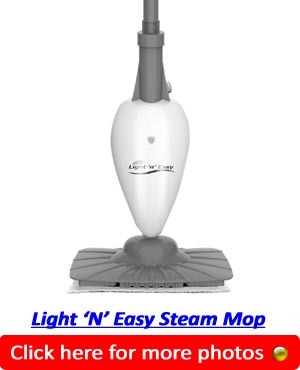 The mopping head on the LIGHT ‘N’ EASY deeply penetrates micro-pores, drawing the dirt that typical mops leave behind. Additionally, the mopping pad has been designed to reach corners and crevices of any hard floor and clean up such areas. Floor sanitization. This steam mop sanitizes the hard floors it cleans without the need to use harmful chemicals. In fact, when used as directed by the manufacturer, it can get rid of more than 99.9% of the potential disease-causing pathogens that lurk on the floor. Large and easy to refill water reservoir. The water tank that can hold up to 7.4 ounces. This means that you can clean a large floor surface without having to constantly refill the water tank. Fast steam production. The mop also produces super-heated stream in a very short time, reducing the wait time before you start cleaning. It also allows you to maintain momentum when you start cleaning without running out of steam. 19.6 feet electricity cord. This steam mop comes with a long power cord that enables you to clean large rooms without having to stop to change power outlets until you’ve finished. This LIGHT ‘N’ EASY Steam Mop has received rave reviews from real customers on Amazon for its exceptional user experience. They enjoy that it is lightweight, sturdy, fast cleaning, and easy to use. Importantly, it is very effective at cleaning without leaving smudges of water behind. However, some of its users have found the cord runs into the mop at a very low angle. This causes the cord to get in the way of the pad, which is never ideal when cleaning. 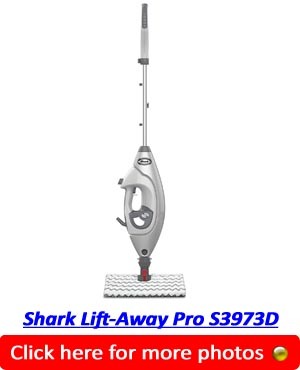 The Shark Lift-Away Pro S3973D is a unique 2-in-1 steam mop. 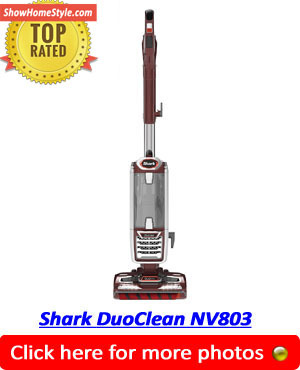 It’s good enough that you are able to use steam for cleaning stuck-on messes, but with the removable steamer for higher areas, the Shark Lift-Away is almost perfect. One of the latest features from Shark is Touch-Free Technology. You’ll be happy to know that releasing and attaching the mop head is done by the touch of a button. No longer do you have to get your hands dirty when mopping. A steam mop is only as effective as the pads that do the soaking. In this case, the high-quality dual-sided dirt grip pads are able to soak up and remove great amounts of water and dirt making washing your hard floor quicker and easier than using a traditional mop. Another great feature of the S3973D is the concentrated surge of steam called the Steam Blaster that matches any tough stain or mess. Great for removing stubborn dirt and stains around sanitary ware or cooker hobs. In order to make your cleaning experience more efficient with the Lift-Away Pro, three steam release levels are available to you giving absolute control over whatever you are cleaning. Some of the reviews that stand out are the ones about how easy the mop is to use, especially with the steamer attachment. Many customers also share the same positive opinion about the durability and overall design, not to mention the steam blasting technology. However, one reviewer pointed out that the safety feature when using the attachment can be somewhat inconvenient. This is because you have to hold the trigger with one hand while directing the steamer head with the other. Apart from this, there aren’t any complaints about the Shark Lift-Away Pro Steam S3973D’s ability to clean even the toughest areas. When it comes to effective and productive cleaning, the Shark Genius Steam S5003D might just be your answer. Here is a quick review to show you why. Touch-Free Technology. The worst part about mopping is having to touch the mop head, either to remove it or to get it thoroughly clean. 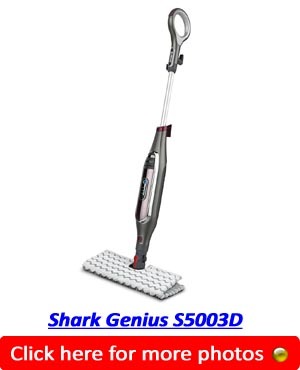 With this Shark Genius design, there is no touching the mop head until after it’s been through the wash. Steam Blaster. If you need to get specific with a tough stain, the steam blaster technology ensures a powerful and targeted blast. In other words, it’s perfect for loosening debris in tough corners too. Double-Sided Dirt Grip Pads. After all the stains have been removed, the mess and liquid get soaked up with double-sided dirt grip pads. With great absorption capability, nothing stays behind. Plus, you drop them in the wash when you’re finished. Different Steam Settings. Just in case you want a little more control over the amount of steam you can use at a single time, there is a 3-option setting available. A Must For Sealed Hardwood Floors. The Shark Genius Steam S5003D is particularly good for cleaning hardwood floors and the handle design makes it very easy to work with. For the most part, users of the mop are pretty satisfied with their choice. On the positive side, a pet owner said it works perfectly when cleaning up after her two dogs. Other positive reviews speak of the low-noise level, durability, and effectiveness to get into tough spots. On the downside, the 350ml water tank can’t be removed. It’s also a little inconvenient that there is no on/off switch, and that the heat adjustment button is closer to the water tank than to the handle. 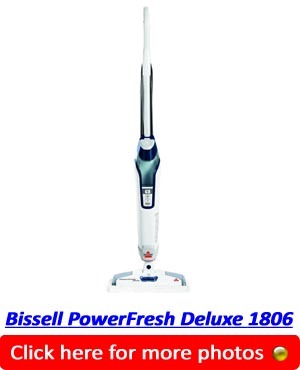 The Bissell PowerFresh Deluxe mop is a floor steamer that is designed to clean tiled surfaces and hardwood floors. The PowerFresh Deluxe 1806 comes with the SpotBOOST Brush. This feature allows users to scrub away even the toughest messes on the floor with little hassle. You’ll also enjoy the versatile controls for precise cleaning. You can choose between low and high steam settings depending on your cleaning needs. It also comes with the Spring Breeze Scent Discs. This feature allows you to not only leave your floor clean and pathogen-free but also smelling amazing. Users can insert the disc in the disc holder. Alternatively, they can insert into the pad, which yields in more intense and enduring bursts of freshness. In addition to the cleaning, it has been designed to sanitize surfaces, leaving users with a sparkling clean floor and a virtually germ-free floor surface. When used as directed by the manufacturer, the PowerFresh Deluxe steam mop will eliminate 99.9% of the bacteria and germs on the surface, all without using chemicals. It comes with an easy to fill water tank that is designed to enhance user experience. Filling the water reservoir on the PowerFresh Deluxe 1806 is pretty straight-forward and it’s up to you whether you use distilled or tap water. This steam mop also comes with a 25 feet long power cord. As such, you can use over a wide area with no problems. With regards to customer reviews, many PowerFresh Deluxe 1806 user really love the water reservoir it has. Not only is it large enough to store enough water for typical home use, it is also easier to use. Users have also had rave reviews about its effectiveness in as far as cleaning is concerned. This steam mop performs removes dirt and grime from all surfaces very well. However, one design feature that many users are not enamored with is the steam hole. Since all the steam comes out of a single hole, the wear and tear the hole experiences is exceptionally high. As such, the hole gets worn away over time, affecting the effectiveness of the mop. That’s why we recommend the Bissell PowerFresh Slim 2075A, reviewed above, as our best steam mop 2018. 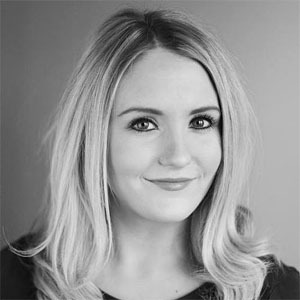 Find more cleaning product reviews at Show Home Style.